Winter in David Thompson Country is magical. This tour takes you to two of our favourite spots: the ice bubbles of Abraham Lake and the narrow canyon of the Cline River. First up is a snowshoe or winter hike (depending on snow conditions) through the lodgepole pine forest as we make our way to a viewpoint overlooking the Cline River Canyon. 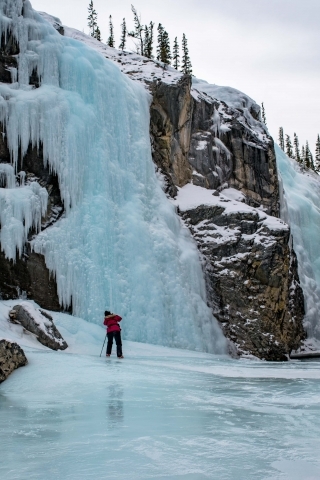 We'll then make our way down into the canyon, walking along a frozen creek, to enjoy a snack surrounded by icefalls. On most days you'll get to watch ice climbers work their way up the canyon walls. 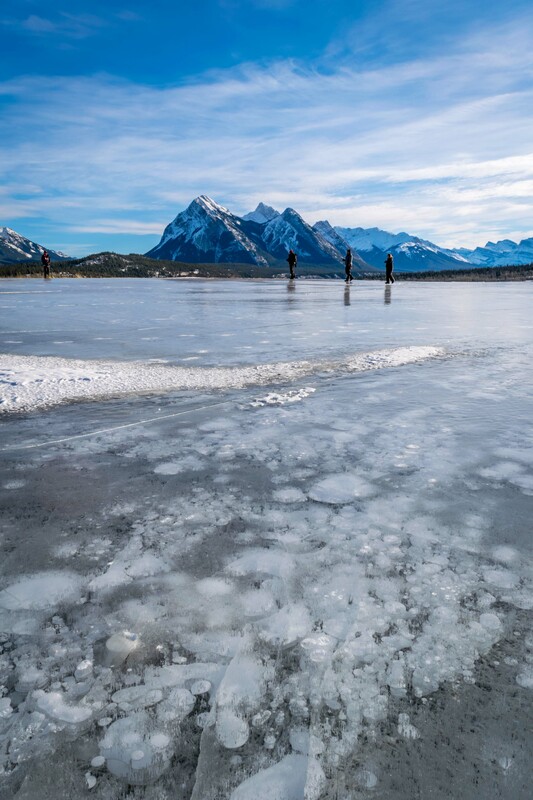 The afternoon is spent on Abraham Lake, hunting for ice bubbles, quirky ice formations and taking in the views from the frozen lake. 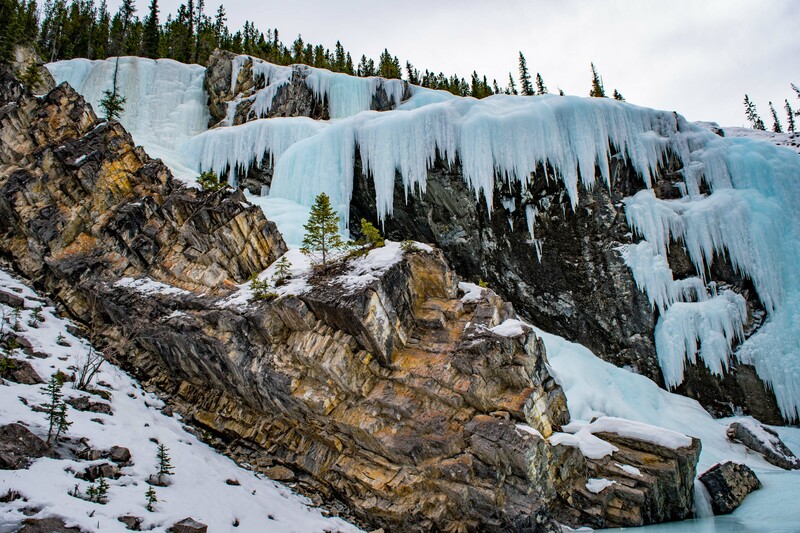 Lunch, hiking poles, snowshoe rentals (if needed), ice cleats, a professional guide and transportation from Red Deer, Rocky Mountain House, Nordegg or Cline River are all included. 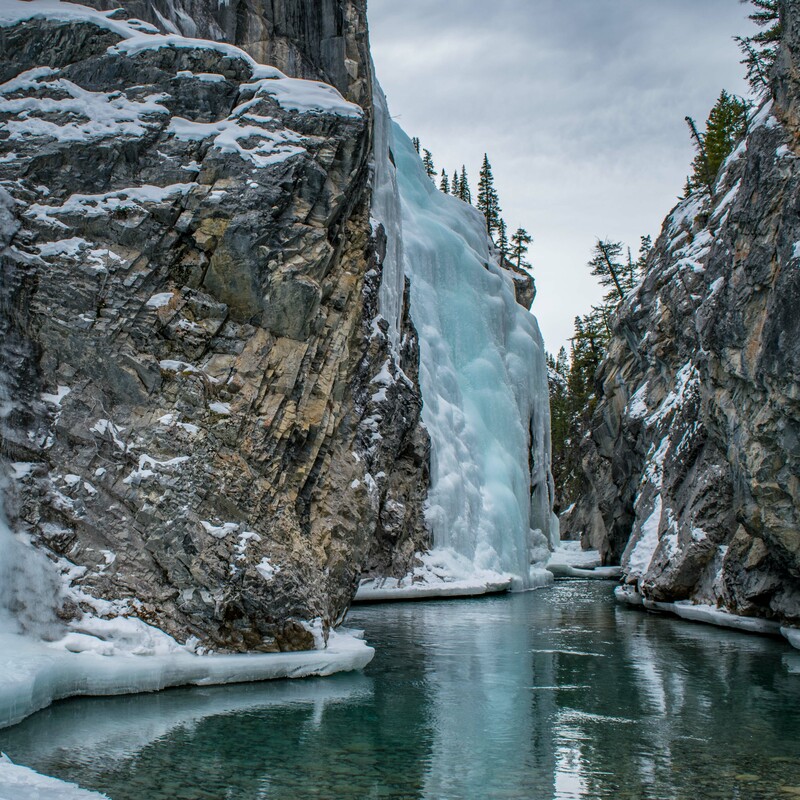 Experience David Thompson Country in its most magical season. See the famous ice bubbles on Abraham Lake. Snowshoe on an easy trail in a scenic area. Enjoy the peace and quiet of the mountains, away from the crowds. Perfect for: Anybody looking for a fun day playing outside. No prior snowshoe or hiking experience required. This day trip is open to all ability levels, whether you are a beginner and or an expert. You must be comfortable walking 4+ km in a variety of conditions. This tour is recommended for those 8 and older. Available daily from December to late March. Early and late season tour follow a modified itinerary. After a walk through the forest with glimpses of Abraham Lake in the distance we come up to the edge of the narrow Cline River Canyon. 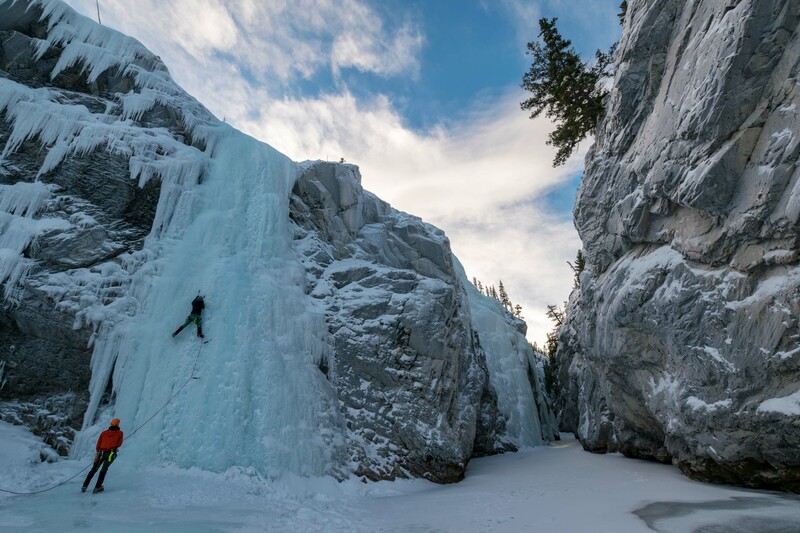 The dry climate in the area makes the icefalls on the edges of the canyon a popular ice climbing area and the views from the canyon floor particularly stunning. As one of our guests put it: "this is the place I didn't know was on my bucket list". Fans of Mary Shaffer's writing will know this area by an older name, Cataract Creek. Officially the river is named after Michel Klyne, the postmaster at Jasper House in the 1820's, who used this route to trade fur on the Kootenay Plains. The trail to the canyon is an easy to moderate snowshoe with 3 short but steeper hills along the way. The snowshoes you'll use are designed for trails and low snow or icy conditions, with crampons built into them. Your guide will share some tips on how to use the snowshoes along the way, making going up and down the hills a breeze. We'll be snowshoeing for 30 to 45 minutes each way, with lots of stops for pictures along the way. When the snow levels are low we'll be putting on micro-spikes instead and heading out for a winter hike. 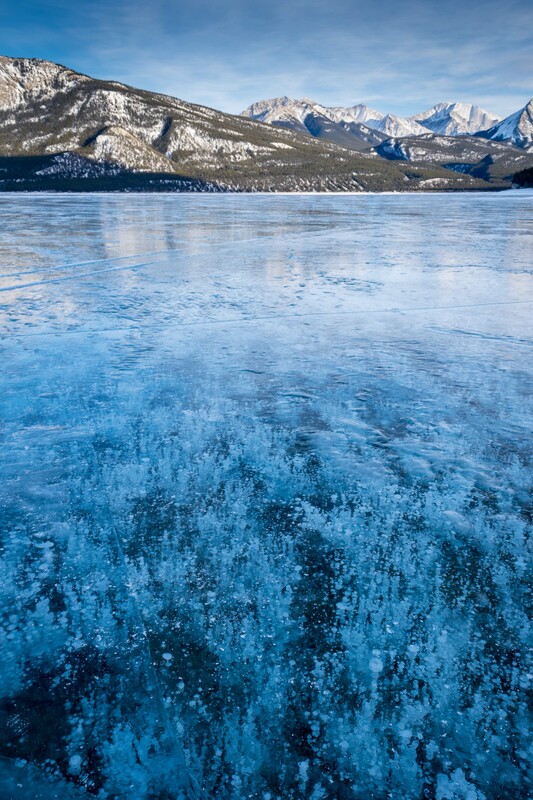 After lunch we're heading out on Abraham Lake for an ice walk. 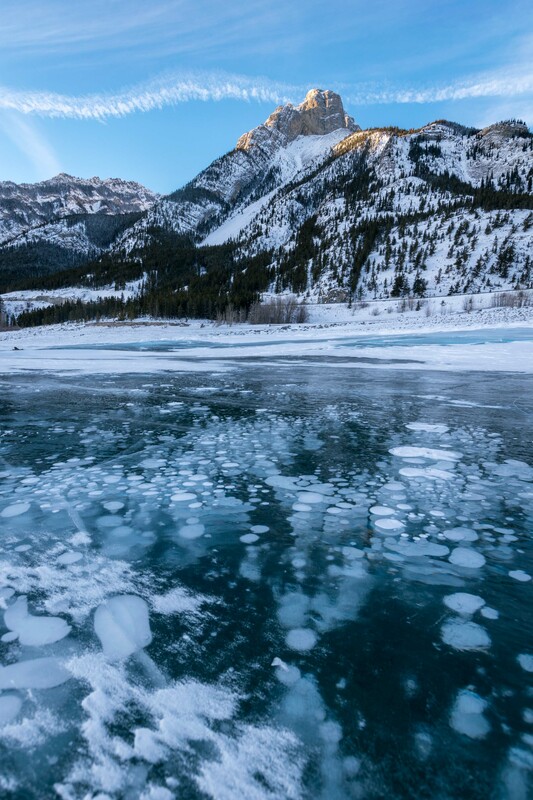 With the methane bubbles under our feet and amazing peaks surrounding us, the afternoon goes by fast as even better sights await us along the way. 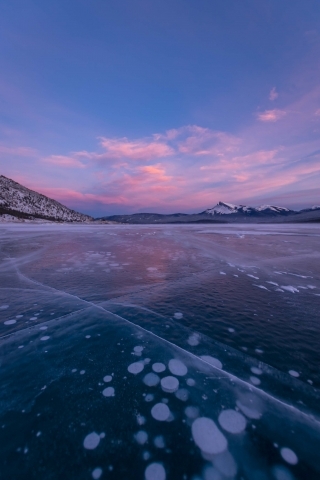 You'll wear ice cleats as we make our way onto the frozen lake with your guide taking you to same of the best and safest spots in the area. You'll never leave hungry from one of our tour. Lunch and snacks vary based on the day but you'll find some delicious food from local producers like Big Bend Market, Viva-Deli, Sylvan Star Cheese, Humble Hummus, Beck Farms as well as our own Montreal style bagels and baked goods. After the ice walk, enjoy a cup of hot chocolate along with housemade marshmallows and graham crackers. Curious about the food? Stop by our Basecamp + Cafe in Red Deer to find out more. Rates are per person, for adults (13+). Kids 12 & under are free. Guides, snacks, snowshoes, ice cleats and activities are all included. Transportation is included from Red Deer, Rocky Mountain House or Nordegg. Options from Lake Louise are also available. Looking to join a scheduled tour instead? The Explorer Series is a great option when you have 1 to 3 people looking to meetup with others for a fun adventure at $110 per person. Be prepared for the mountain weather. Conditions can change quickly and our winter tours run in anything from - 30C to +10C. 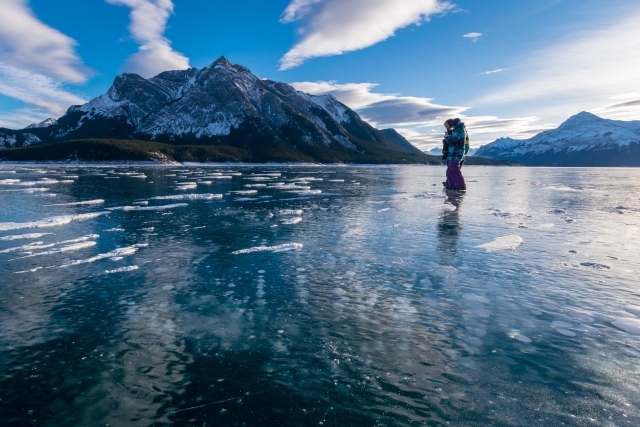 Abraham Lake is a very windy place, bring an extra layer with you just in case. We provide hiking poles, ice cleats and snowshoes at no charge for this tour. Gourmet lunch and hot chocolate. What kind of lunch is included? Honey maple turkey sandwich (honey maple turkey, Boursin cheese, lettuce, tomato, cucumber with deli mustard on a Montreal style bagel). Lunches also include a juice box, veggies and dip, fruits and dessert. Hot chocolate is available with dairy or soy milk. Tea is available as well. Please make sure to mention any dietary requirements when you book your adventure and we will try to accommodate whenever possible. What kind of transportation is provided? Transportation, when selected, will be in an SUV or minivan, full size passenger van or 16 passenger bus depending on the group size. Is transportation available from Lake Louise? 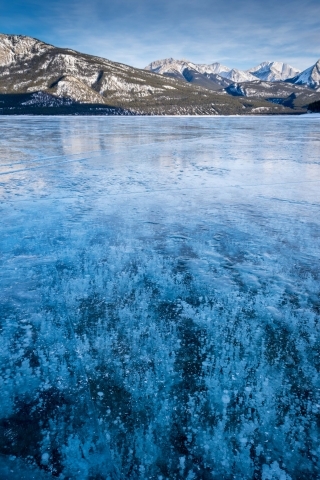 Transportation from Lake Louise is not included but is available as an add-on. Departure from Lake Louise is at 8 am, return between 4:30 and 5:30 pm. Rates are in addition to the regular tour rates. What's the difference with the other ice bubble tours? This tour includes a 60 to 90 minutes ice walk at of the best spots in the Abraham Lake area combined with a snowshoe or winter hike into the Cline River Canyon. 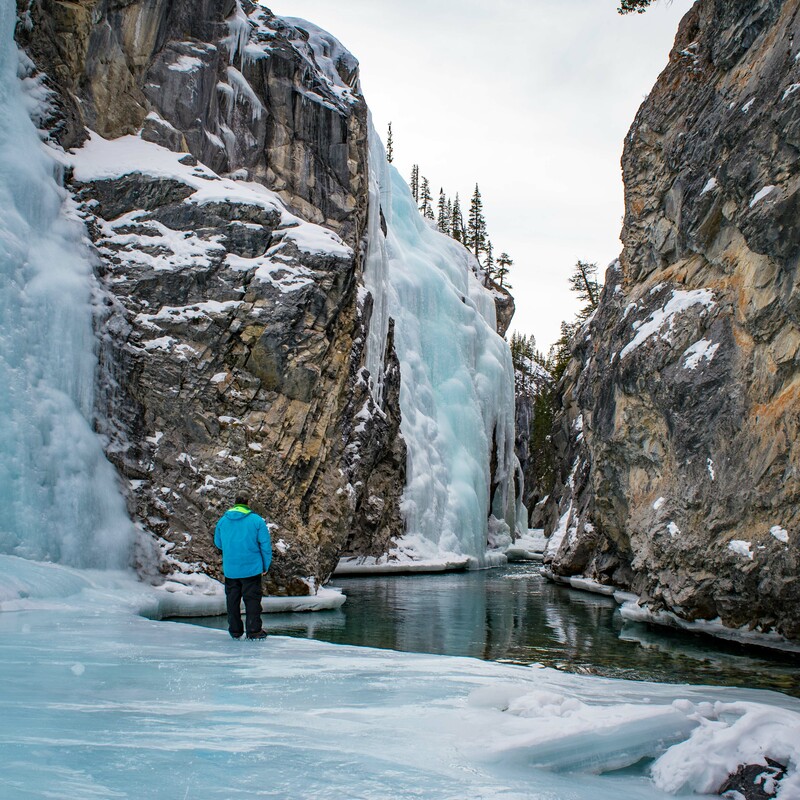 The Crescent Falls + Ice Bubbles tour includes similar afternoon ice walk on Abraham Lake but with a less strenuous morning walk. 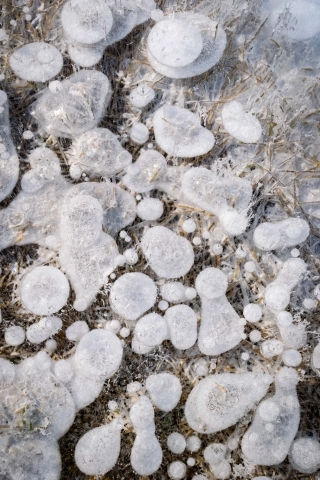 The half day Ice Bubbles tour includes a similar ice walk to the afternoon portion of this tour. 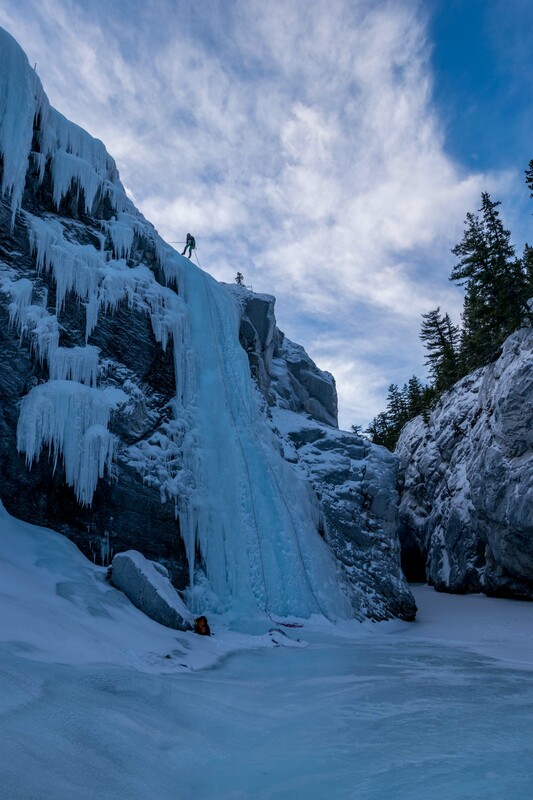 The Siffleur Falls Winter Hike is a great option for those looking for a more active adventure while still getting a chance to see the bubbles on a shorter ice walk. This tour is recommended for those 8 or older.